Atiku Abubakar, Nigerian presidential candidate of the opposition Peoples Democratic Party (PDP), arriving at the U.S Chamber of Commerce on Friday. In an interview with VOA Hausa Service in Washington DC, Alhaji Atiku Abubakar said stories that he was banned from the United States was ‘disinformation’. 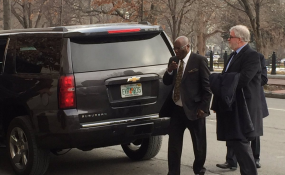 Atiku He spoke on Thursday, after his arrival to the US capital, where he lodged at Trump International Hotel. Here is the transcript of the interview conducted by VOA’s Aliyu Mustapha Sokoto. VOA: What has been in the news for many years has come to past right now I’m together with the former Vice President of Nigeria and the Presidential flag bearer of the Peoples Democratic Party (PDP) after he had just returned from some interactive session with some high ranking Congress Men and Women. Your excellency, now that you have visited Washington D.C, does it have to do with those who said you cannot come to the United State of America or the visit is for what purpose? How long more can Nigerians wait? Atiku: Aliyu, I told you before that my coming to the United State is in the hands of Americans if they decided to issue a Visa to me I will definitely come and if they refused to give me I cannot come. And now they have issued it to me and I am here. I’m having some positive discussions with some of the officials. I was in the Congress and I had discussions with some high ranking Congress men and Women about Nigeria and how Nigeria intends to improve her relationship with the United States of America. VOA: Before, some people are saying that you cannot come to the United States of America but now you are here people will stop doubting. Atiku: The whole thing is about misinformation. Atiku: There is no doubt because the United States is ready to support any country that is practicing democracy.